There is not just one Hotel Causeway Melbourne, but three. All of them are located conveniently right in the heart of the CBD: the elegant Boutique Hotel Causeway, the stylish Causeway 353, and the affordable Causeway Inn. The Hotel Causeways is an elegant sophisticated 4 star boutique hotel in a fantastic location within the network of Melbournes lanes and arcades. It is right on Howey Place, an insider location for fashionable boutiques and cafes. With its 45 rooms, it is intimate enough to create a warm and private atmosphere. It has a unique rooftop courtyard and sun deck, a gym and steam room as well as business centre. For secure bookings and very best prices, you can book the Hotel Causeway Melbourne here - No Reservation Fees! The Causeway 353 is also a 4 star stylish hotel with 142 rooms. 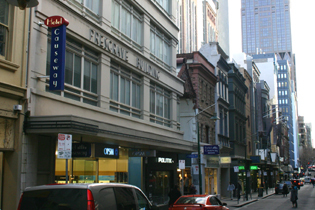 It is only a few minutes from the Hotel Causeway and located on the corner of Equitable Place, in Little Collins Street. It is large and modern  many of the rooms have Jacuzzis. There is a great restaurant with buffet breakfast or a la carte menu for lunch and dinner. For secure bookings and very best prices, you can book the Causeway 353 Hotel here! This Causeway Hotel offers affordable 3.5 star accommodation right on Bourke Street Mall, opposite the GPO. It has 82 rooms with simple clean décor each with their own bathroom. You can get breakfast in the Hotel Lounge or just dash into one of the cafes in the lanes around Little Collins Street and Flinders Lane. For secure bookings and guaranteed best prices, you can book the Causeway Inn on the Mall here!